In the brief opening sequence, set inside their New York environs house, young 4 year-old Peter Parker (Max Charles) was playing hide-and-seek with his scientist father Richard (Campbell Scott), an arachnologist. He entered his father's study where research papers were strewn about - evidence of a break-in. 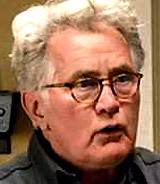 Richard hurriedly retrieved some hidden documents in a desk drawer and fled with his family (including wife Mary (Embeth Davidtz)) to the Queens home of Aunt May (Sally Field) and Uncle Ben (Martin Sheen). Peter was mysteriously left there, with his father's last words: "Be good." Years later in 2012, Peter (Andrew Garfield) was a nerdy, teenaged loner and student at Midtown Science HS, interested in photography, skateboarding, and science. In the hallway, he was bullied by Eugene "Flash" Thompson (Chris Zylka), and later outdoors confronted Flash, who was now picking on someone else. Peter was beaten up in front of other students, until pretty blonde classmate Gwen Stacy (Emma Stone) intervened and broke up the fight. Later at home in his flooded basement, Peter discovered his father's stored briefcase. Inside, he found a newspaper article-picture of his father with a fellow employee. Also there were pens, his father's old glasses, his Oscorp ID staff-badge (for the Genetics Laboratory), and a calculator. In the side pocket of the briefcase, in a hidden compartment, he found his father's research papers (including a top secret equation or algorithm on Decay Rates). He learned the identity of the other man in the photo from Uncle Ben. His father had been an employee at Oscorp Industries, working with scientist Dr. Curtis Connors (Rhys Ifans) on Cross Species Genetics. Peter searched on the Internet for more information (Connors had written a famous paper called "A World Without Weakness"). He learned that his parents were both killed in a plane crash - hence, Peter was adopted by his relatives. Peter realized that there was an Oscorp Industries intern program for "24 lucky students" chosen to work with Connors in the Oscorp Lab - although enrollment was closed. In the lobby of the Oscorp Tower (with 108 floors) the next day, Peter stole one of the intern's ID badges (Rodrigo Guevara) to gain entry, and joined an intern tour of the facility led by Gwen, head intern for Dr. Connors! The group met the reknowned one-armed scientist, the world's foremost authority on herpetology (reptiles), who was seeking a radical solution to create a "world without weakness" through Cross Species Genetics (or regeneration). 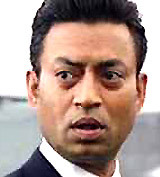 As he was sneaking away from the tour, Peter literally bumped into Dr. Connors' immediate superior, Dr. Rajit Ratha (Irrfan Khan). He followed him unnoticed, then snuck into a restricted-access, secured lab room full of genetically-altered spiders spinning webs, used to create very strong 'bio-cable.' When he accidentally tampered with the mechanism, some of the spiders fell free to the ground and on top of him. As he fled from the lab and facility, Peter was seen by Gwen. He returned the stolen ID badge, and then was bitten on the neck by one of the escaped spiders. Superpowers and organic changes began to emerge as he returned home on the subway (missing his regular stop and proceeding onto Coney Island) - enhanced reflexes and agility, stickability, increased appetite and destructive strength. After he arrived home late, he apologized to his Aunt and Uncle. The next morning, he located the spider that bit him (and kept it in a small bottle), and was worried about the after-effects of the spider-bite. While doing his homework and after perusing his father's papers, Peter decided to visit Dr. Connors at his private home. He was turned away until he identified himself as Richard Parker's son. Connors spoke of his work with Peter's father to change the lives of millions through Cross Species Genetics - by the breeding of spiders. Connors also wanted to regenerate his missing right limb, but the promising experiments went cold when Parker died (his secret research went with him). Peter wrote out the Decay Rate Algorithm, his father's calculation, and provided the equation to Connors. Afterwards, Peter realized that he was a successful example of a Cross Species Human-Spider, with super-powers. The next day on the basketball court at school, Peter found vengeful retribution when he humiliated Flash during a practice session in front of his classmates - by slam-dunking the basketball and breaking the backboard. His destructiveness caused him to be sent to the Principal's office, where he was disciplined with community service. His Uncle had to change shifts at work to meet with him, now making Peter responsible for picking up Aunt May at 9:00 pm that night. In the hallway, Peter nervously spoke with Gwen and asked her out (although no specific date was set). While skateboarding, he surprised himself with his new strength and abilities. He met with Connors at Oscorp (ignoring a phone call from Ben reminding him to pick up May) where cross-species limb-regeneration between a lizard and a host subject - a three-legged lab mouse, was successfully demonstrated. When Peter returned home late, he realized he had forgotten to pick up May. He claimed he was distracted - and entered into an argument with his scolding Uncle. Ben claimed Peter's father lived by principles - he responsibly did "good things" for people out of a moral obligation. Peter angrily counter-argued that his father didn't follow the responsibilities of fatherhood, and then stormed out into the night (Uncle Ben followed after him). At a convenience store, Peter witnessed a cash-register robbery in progress, and when asked to help chase the long-haired thief by the disgruntled cashier, he asserted: "Not my policy." On the sidewalk, the armed robber ran into Ben - they scuffled for his dropped gun - and Ben was shot and killed instantly. Peter came upon his bleeding Uncle and was shocked by his death. Afterwards, guilt-ridden Peter knew that the killer had a tattoo of a star on the inside of his left wrist - he used that identifying mark to hunt possible suspects. One night in an alleyway, he beat up an assailant (with his accompanying gang members) of an attacked female, but discovered the man wasn't the killer. In the next sequence, Peter began to create his Spider-Man persona to be used to pursue criminals - in particular, his Uncle's murderer. A wrestling mask on a poster inspired him to create a red mask for himself, and he manufactured Web-shooters for his wrists, to fire high-tensile bio-cable 'webs' - useful for swinging on web vines. He also developed a red and blue spandex costume for ease of mobility and increased velocity. The NYPD, led by NYPD Captain George Stacy (Denis Leary), Gwen's father, thought the mysterious, masked unitard character was a menacing vigilante or anarchist, although bystanders considered him an amusing folk hero. When he would often return home late at night, his Aunt was dismayed that he was bruised. In the meantime, Dr. Ratha was pressuring a reluctant Dr. Connors to begin human trials for limb-growing regeneration, suggesting that he start first at Brooklyn's Veterans Hospital. They could claim they were only administering a serum of flu shots. He was concerned that they quickly find a solution for the rapidly deteriorating Norman Osborn, the founder of Oscorp - he asserted: "The clock is ticking." When Connors refused, just as Dr. Parker had 15 years earlier, Ratha threatened: "The formula is ours now anyway. Say goodbye to that arm you have dreamed of. I'm shutting you down." In desperation, Dr. Connors injected himself with the revolutionary, reptile-based regeneration serum to help re-grow human tissue and his missing limb. At first, the injection appeared to work - but it soon had disastrous side-effects. At school, Gwen invited Peter to her apartment (2016) for an 8:00 pm dinner of branzino fish. Peter appeared on the fire-escape outside her apartment's bedroom window on the 20th story, explaining that the doorman was "intimidating." Her father awkwardly walked in on them (and became suspicious of Peter) - and announced that dinner was ready. During the meal, they discussed the dangerous, vigilante-style, masked "spider-guy" - "who's assaulting civilians in the dead of night," although Peter disagreed with Gwen's slightly-angered father, claiming the guy was "providing a public service" and "trying to help" - from the video he had seen on the Internet. Peter asserted Spider-Man's objective: "Protecting innocent people from bad guys" - the same as the police. Peter and Gwen retreated to the rooftop - where he confessed: "I've been bitten." Gwen admitted the same - expressing her romantic crush on him. Tongue-tied, he then revealed he was Spider-Man by spinning her into his arms with a shot of web-biocable. As they kissed, she blurted out: "You're Spider-Man." To intercept Dr. Ratha on his way to the Veterans Hospital, Connors took a taxi to confront him. Peter heard sirens wailing and tires screeching - from the direction of the Williamsburg Bridge, where a massive traffic jam had stalled Dr. Ratha in his limousine. He left Gwen and headed there. A monstrous reptilian creature, Connors transformed into a giant, nine-foot, villainous and destructive Lizard-man, was searching cars. When it located Ratha's car, the Lizard threw it off the bridge, although Spider-Man saved it (and other vehicles) with web-vines. Spider-Man also rescued a young boy named Jack (Jake Keiffer), son of Ray (C. Thomas Howell), who was trapped in one of the suspended cars. 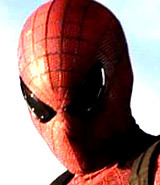 When the car burst into flames, Spider-Man coerced Jack to wear his mask and climb out of the vehicle in order to save him. Peter officially identified himself as Spider-Man to the grateful father. Dr. Connors, now back in his human form, took refuge in the New York sewers before returning to his Oscorp office the next day. Peter listened to a morning news-report that Capt. Stacy was placing an arrest order for the masked vigilante known as Spider-Man. As Peter spoke with Dr. Connors in his lab during a free period about rumors of a "new species" of reptile ("aggressive if threatened") in New York, he noticed remnants of reptilian skin on Connors' neck. After Connors left, a shocked Peter noticed the escaped and enlarged lab mouse Fred bloodily feasting on another smaller mouse. At the NYPD headquarters, Peter reported to a disbelieving Capt. 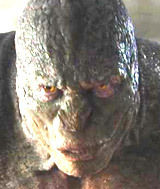 Stacy that Dr. Connors, Gwen's scientist-mentor, had "transformed himself into a giant lizard...He's using lizard DNA. He is dangerous, and he is planning something horrific." In fact, Connors was conducting further experiments in an underground sewer lab, reporting on his own enhanced mutant super-capabilities, and reinjecting himself with an increased serum dosage. Spider-Man descended into his sewer-lair, awaited the Lizard-man's arrival, and web-attached his camera to the wall to record a confrontation with the ruthless creature. Underwater, they wrestled with each other within the sewer pipes before an injured Spider-Man (from the Lizard's claws) was able to escape through a narrow passageway, and reunite with Gwen who tended to his chest lacerations. Peter expressed to her how it was his "responsibility" to stop the Lizard-Man, because he had given Connors the secret equation (developed by his father) that caused all the trouble: "I have to fix it." He took Gwen, holding onto his back, for a swinging ride through NY's skyscrapers. Afterwards, the Lizard found the camera - labeled "Property of Peter Parker" - and learned of Spider-Man's identity. At Midtown Science HS during the school day, the Lizard attacked Peter who quickly donned his Spider-Man costume (from his backpack), and was able to save Gwen from injury by tossing her out a window. The two battled in the school's deserted hallways and library (an oblivious librarian (Stan Lee in a cameo) wearing headphones was unaware), as Spider-Man now realized that the Lizard had become ruthless, vicious and determined to infect many more humans. He spoke to Gwen by phone, and requested that she create a reptilian antidote in the Oscorp lab. After accessing the cross-species file (12389), she would create a blue serum to be dispersed as an antidote cloud, to prevent the demented Dr. Connors from releasing a more harmful green chemical cloud on everyone from Oscorp Tower, in the belief that he was creating a stronger race. A SWAT team of the NYPD peppered the Lizard with bullets, and watched in horror as the creature regenerated and healed - and counter-attacked by releasing a green cloud (a "biological agent") from a canister. The humans were immediately turned into reptilian lizards. The Lizard continued to terrorize Manhattan, as the NYPD was searching for both the Lizard and Spider-Man. Gwen was preparing the antidote within Oscorp Tower and issuing an emergency evacuation when she was warned by Peter that the Lizard was approaching. As Spider-Man was swinging to the Tower, the NYPD shot him down and tranquilized him with a stun-gun, and he was injured from a hard fall onto a taxi. Although he revived and assaulted the group of officers surrounding him, his identity was revealed to Captain Stacy who had removed his mask. Spider-Man alerted Stacy to the dangerous situation: "It's headed to Oscorp, and your daughter's there right now. You gotta let me go" - and he convinced him to release him. On his way again, Spider-Man was then shot in the leg - but aided by construction worker Ray who cleared a path to the distant Oscorp building with a series of tower cranes. At the same time, the NYPD had called for a city-wide evacuation of everything south of 54th Street. Inside Oscorp, Gwen was stalked by the terrorizing Lizard, who grabbed a large Ganali projectile launching device to disperse his harmful cloud of green serum from the peak of the building over the city. At Oscorp's street-level entrance, Gwen delivered the canister of blue-serum antidote to her father, as the Lizard prepared the Ganali device on the Tower to disperse his own harmful green gas in only two minutes. "I was wrong about you, Peter. This city needs you. Here. (He handed him his mask) You're gonna need this. You're gonna make enemies. People will get hurt. Sometimes the people closest to you. So I want you to promise me something, okay? Leave Gwen out of it. Promise me that. Huh? You promise me." 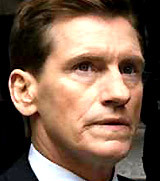 The "mastermind" of the terror plot, Dr. Connors was taken into custody and put behind bars. [Note: This was the first live-action Spider-Man movie in which the villain went to jail for his crimes.] After a "rough night," Peter returned home to Aunt May, again bruised and tired, but was able to deliver a carton of eggs from his backpack and receive a grateful hug ("It's all right"). The funeral of Captain Stacy was held during a dark thunder-storm, but guilt-ridden Peter only watched from afar on the church rooftop, to honor the Captain's request to keep Gwen out of it. At his house, she later reprimanded him for not attending ("Everyone was there but you"), and started to leave after he admitted: "I can't see you anymore." But then she realized that he was only keeping a promise to her deceased father: "He made you promise, didn't he? To stay away from me, so I'd be safe." When encouraged to see more of Gwen by his Aunt Mary, Peter replied: "I can't...I'm just no good for her." "Peter, I know things have been difficult lately, and I'm sorry about that. I think I know what you're feeling. Ever since you were a little boy, you've been living with so many unresolved things. Well, take it from an old man: Those things send us down a road. They make us who we are. And if anyone's destined for greatness, it's you, son. You owe the world your gifts. You just have to figure out how to use them. And know that wherever they take you, we'll always be here. So come on home, Peter. You're my hero. And I love you." Miss Ritter: "I had a professor once who liked to tell his students that there were only 10 different plots in all of fiction. Well, I'm here to tell you he was wrong. There is only one: 'Who am I?' Mr. Parker. Tardy again. Well, at least we can always count on you." Peter: "Sorry, Miss Ritter. Won't happen again. I promise." Miss Ritter: "Don't make promises you can't keep, Mr. Parker." Peter: (whispered) "Yeah, but those are the best kind." Gwen gradually smiled - realizing that soon enough, Peter would break his promise and they would continue their relationship. From a perch high above the city, Spider-Man surveyed New York - and then displayed his miraculous skills, before the credits began. This was the fourth Columbia Pictures film based on the superhero, after director Sam Raimi's trilogy - released as a big-budget summer blockbuster on July 3, 2012. 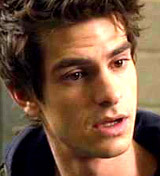 It starred a new lead character, young Andrew Garfield (from The Social Network (2010)) as Peter Parker (replacing Tobey Maguire), opposite Emma Stone as his pre-Mary Jane Watson (Kirsten Dunst) high-school girlfriend Gwen Stacy. [Note: Bryce Dallas Howard played Gwen Stacy in Spider-Man 3 (2007).] 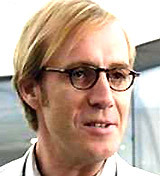 The memorable, pathological and deadly villain was scientist Dr. Curt Connors (aka the Lizard) (Rhys Ifans), a one-armed former research co-worker with Peter's father. The character had first appeared in issue 6 of Marvel's The Amazing Spider-Man in 1963. It was a leisurely-paced origin-story - and reboot - of the original franchise, both sweeter and edgier, with less emphasis on CGI special effects than previous iterations, and more focused on the emotional romantic angle and character development. 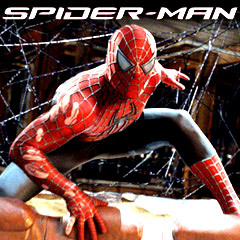 Plans were underway for a new rebooted trilogy - with the first sequel to be released in 2014, also directed by Marc Webb (appropriately named! ), The Amazing Spider-Man 2 (2014). With a production budget of $230 million, and box-office gross receipts of $262 million (domestic) and $752.2 million (worldwide). It was lower-grossing (domestic and worldwide) than all of the films in Sam Raimi's original Spider-Man trilogy, but it grossed more than its sequel. Released in both 3-D and IMAX 3-D.
Set-pieces: The Lizard's attack on the Williamsburg Bridge, the struggle between the Lizard and Spider-Man in the underground sewer, at Peter's high school, and on the Tower at the top of the Oscorp Building.